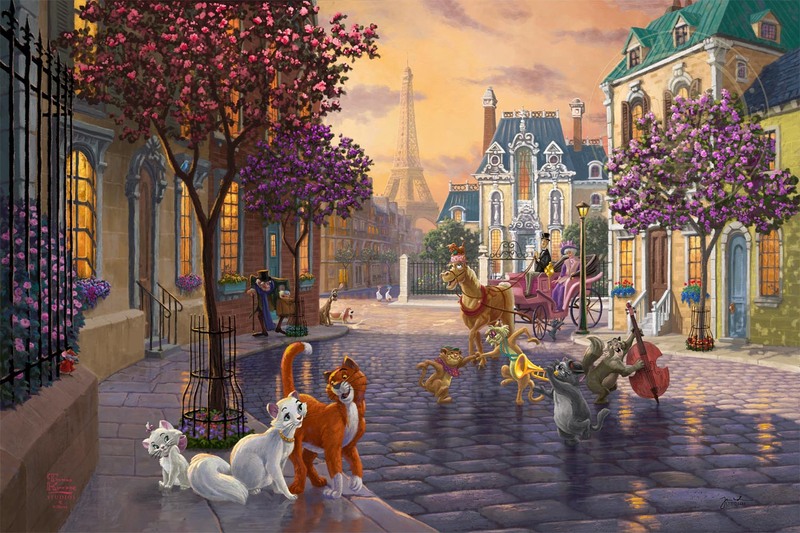 Thomas Kinkade Studios is proud to revisit the 1970 classic film The Artistocats, a story of love, family, companionship, greed, betrayal, heroes and true friendships. Those sentiments are portrayed throughout the painting, from the quiet Paris neighborhood to the romance of the Eiffel Tower. The old man on the left is Georges, Madame Bonfamille’s attorney. As Madame reveals her will to Georges, her butler Edgar overhears that she is leaving her fortune to her cats and then upon their death her estate will pass on to him. The impatient scowl on the face of Edgar is a preview of his plot to do away with all four of Madame’s cats and their claim to Madame Bonfamille’s estate. Join us as we peer into the lives of a misfit cast of militaristic dogs, gossipy geese, and tough alley cats as they help a family of felines make their way back home. The little mouse, Roquefort, was brave enough to rally the jazz band alley cats to join in the final defeat of Edgar’s plot along with Frou-Frou the horse.